I was reminded of how critical the role of journalism can be when a journalist acquaintance, interviewing a local politician, let pass a bland reply about the origins of current climate change implying, incorrectly, that it may be natural. More than likely the pollie was just ‘hedging his bets’ rather than propagating the American narcissist’s incessant ‘fake news’ claim (I think it was Nazi minister for propaganda Goebbels who stated that if a lie was repeated often enough people will believe it). But it is a sad commentary on our current media that a PhD may be required to sort out what is real from propaganda. Is a journalist that lets an interviewee get away with a misleading statement on climate thereby helping propagate this crime against humanity? How do journalists handle climate change? Journalists have continuous pressure on them – meeting deadlines, satisfying editors and bosses, and searching out real news stories amongst the banalities of press releases from various organisations, politicians and pressure groups. They are continually involved with the immediacy of their information and a desire to be first off the rank with the story. But stories lacking this immediacy and requiring a longer term view such as the manifold effects of climate change are relegated down the list of priorities or often miss out entirely. Private ownership of the media means a bias towards the status quo and conservatism. Even the publicly owned news outlets are strongly influenced and often lead by this. Generally the media has a pro-capital and anti-labour stance although sometimes this is very subtle. Examples of propaganda in the nineteenth century abound. David Syme of the Age pushed protectionism and changed governments in Colonial Victoria and the Daily Telegraph for a decade or so pushed a strong ‘Christian’ and teetotal agenda. In the 20th century there was the pro-war jingoism of the Herald and general anti-labour stance of newspapers for most of this century. We also have the vicious and sometimes spiteful climate change denialism of the Murdoch media – notably in the Australian – of the last 30 years. Recently Parker and Woodworth in their Unprecedented Crime (Clarity Press, Atlanta, 2018 ) made the case that climate change denialism was a ‘crime against humanity’ and that the media were strongly implicated in this. For powerful organisations to control the agenda and influence the political process they need the assistance of the media. In this they have taken advantage of the scientific illiteracy amongst the general population and perhaps even amongst journalists. One murder may dominate the media and yet the insidious deaths of thousands in climate change influenced events like heatwaves remains unreported. Can journos do better? 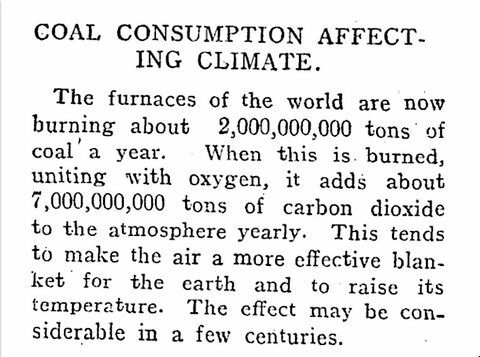 The image above is taken from a New Zealand country paper of 1911. This paragraph summarises the essence of the greenhouse effect and anthropogenic global warming in 65 words. Perhaps by consulting a few basic sources, even Wikipedia, journos will be able to ask our pollies the right questions and when they reply with myth, misleading statement or fail to answer the question, make some attempt to hold them accountable. Very difficult I know but some unknown Kiwi journo/ editor did it many years ago.